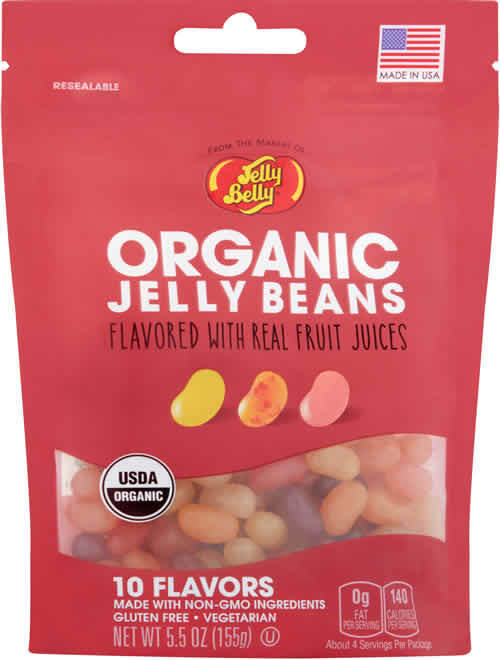 We return to the world of organic jelly beans this week with the first of three varieties of organic beans from Jelly Belly. This particular one is the least thematic of the three, billed as simply “10 Flavors”. These beans claim to be USDA-certified organic, made with non-GMO ingredients, gluten-free, and vegetarian. The package also says that they are made with real fruit juices and purees. Those all sound like great things, but how do they rate? Like regular Jelly Belly beans, these are a little undersized. Unlike regular Jelly Belly beans, they are not nearly as precise in their shape and do not resemble a real bean nearly as well. I presume this is due to them being unable to use certain ingredients that help regular Jelly Belly beans achieve that perfect, consistent shape. They do still make a good effort at a dimple, though. These beans chew remarkably similar to regular Jelly Belly beans. It still takes a little too much effort to chew them, though I would say it is slightly improved in the organic beans. As was the case with the first two sets of organic jelly beans I reviewed (Surf Sweets and YumEarth), the texture is a weak spot. The shell gets powdery, perhaps even slightly gritty, as you chew, and the insides end up being pretty mealy. A big disappointment, given my love for the classic Jelly Belly texture. The biggest problem with the flavors in this pack is that two pairs of Flavors are visually indistinguishable from each other: Lemon and Coconut, and Red Apple and Cherry. That first pair is particularly problematic if you’re a person that hates coconut. I’ve had some that I had to look really close at in the past, but I was always able to identify them in the end. Here, I truly cannot. I definitely tasted both Lemon and Coconut when pulling from my pile of white-ish-yellow-ish beans, but I actually couldn’t distinguish between the Red Apple and Cherry flavors, leading me to wonder if I actually didn’t get any beans from one of them. This bag is only 1.9 oz., and I only received three beans for a few of the flavors, so I wonder if it’s possible I received no beans for either Red Apple or Cherry. All that aside, the flavors are generally great. Berry tastes very much like a combination of blackberry and raspberry, and Blueberry is a distinctly different flavor, reminding me of a sugary blueberry muffin. Strawberry evokes the taste of those frozen fruit bars that are made with real strawberry. Orange tastes like actual orange juice, with the appropriate acidity. All of these are very high quality flavors. Of course, there are a couple flavors that don’t work so well, to me. The Peach bean, even with completely natural flavoring, according to the packaging, still doesn’t taste like a true ripe peach. And Pear, a flavor I’m never a huge fan of, tastes dead-on like golden raisins, to this tongue. Overall, the flavors in this selection are very good. The inability to pick out the nasty coconut beans is the biggest travesty here. The inability to distinguish between two pairs of these flavors also presents a unique challenge for the one-of-each test. I ended up taking two from the Lemon/Coconut pile and two from the Red Apple/Cherry pile, to ensure that I got an accurate sense of the challenge of eating 10 beans of tough Jelly Belly chewability. It was definitely difficult. Flavor wise, a selection of 10 flavors also hurts the results of this test. Even with very distinct flavors, there are just too many to feel like you can taste them all in the time that you spend chewing, even with the amount of time it takes to chew this mouthful. On the bright side, you do not get the overwhelming taste of sugar that you can get with a lot of jelly bean sets, and the overall impression you get from these flavors mingling is a very pleasant fruit juice. A solid outing for the first package of organic Jelly Belly jelly beans. I’m looking forward to the future sets with a more manageable flavor count, and hopefully no pairs of visually indistinguishable flavors.